There's at least one nice thing about getting older: the birthday cakes get better! And so do the parties. And so do your friends. I actually have a lot to be thankful for right now. I love where I am, I love who I'm with. I have some fantastic peers, supportive friends, some great projects on the horizon. I have a lawn mower! Who knew that mowing the yard could make me so happy? 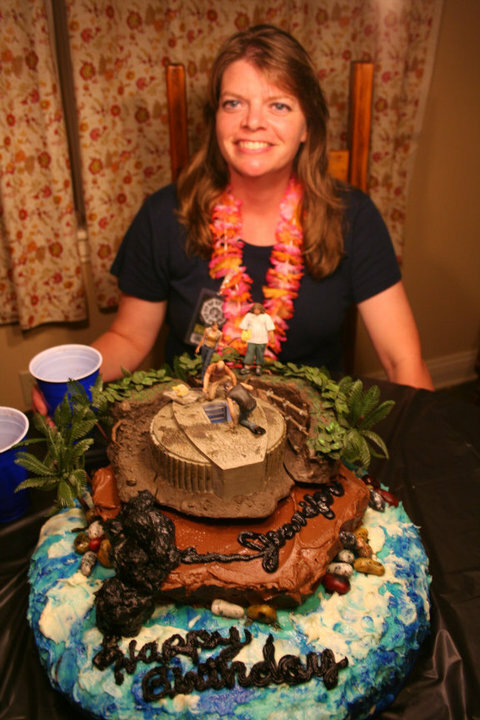 About this fabulous cake: this was made by none other than Paula Pendergrass, owner of Cakes Alive! in Dover, AR. She is a former anatomy professor who decided to delay retirement by opening her own bakery. The cake was chocolate with buttercream icing. The top layer was a plastic molded scene, featuring the characters Jack, Kate, Locke and Hurley from the popular TV show LOST. The hatch had a functional light bulb it it, which looked great when the ceiling lights were turned off. And yes, that is the smoke monster spelling out "Happy Birthday, Jennifer!" It was made from marshmellows and black icing. This was our first night on the pier, at the Gulf Coast Research Laboratory in Ocean Springs, Mississippi. The students from Tech's coastal ecology course were excited to be out of Arkansas, and I was elated to be near the ocean again. (I'm the one sitting with the fishing pole.) There were two other students who liked to fish, and we spent many nights after dark on this pier, catching strange creatures that you just don't come across in the freshwater lakes and rivers of Arkansas. You can see Biloxi illuminated in the background. I didn't go there the night the students went to check out the casinos. We were staying awake for the all-nighter diel study that needed to be continued at 4:00 in the morning. Instead I stayed up watching the final episodes of "LOST." We did not come across any oil in the Gulf during or trip, but we could smell it in the air when the wind blew towards us. 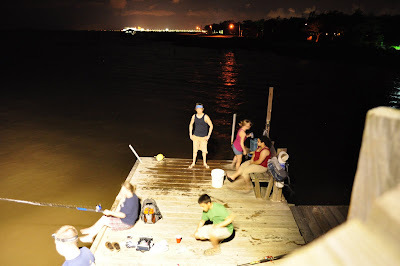 We saw dolphins playing out in the Gulf, and some near the pier where we fished every night. I am hoping they will still be there next year. Today at Lowe's, I was thrilled to see that the Hitachi line of power tools resembled something that would be used by superheroes. Look at this design (photos above.) It screams, "I'm Japanese, and I'm going to kick your ____!" An older gentleman was watching me handle the cordless drills, and he asked, "Are you going to buy me one of those for Father's Day?" I laughed and said, "No. I'm going to buy one for myself." I asked him if they looked Japanese to him, and he said, "Yeah, it looks like that kung fu crap." 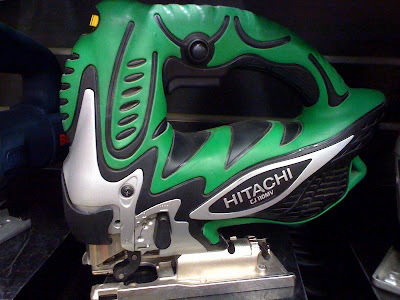 I talked to the sales associate, and he said that Hitachi made good drills and they had a good reputation. And, the one with the lithium batteries would last the longest. 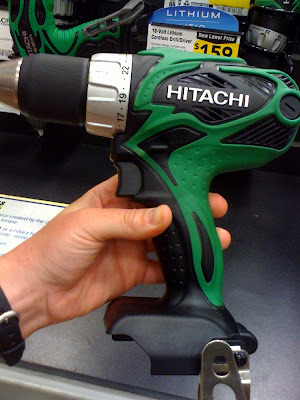 Watch out, world; I now have my own kung fu, Godzilla-colored cordless drill!